2019 is the Year of the Pig according to Chinese zodiac and to celebrate we have a delicious recipe thanks to Falcon to share. Heat a frypan over high heat and toast the coriander and fennel seeds for 1-2 minutes until fragrant, transfer to a mortar and pestle and pound until ground. Score the pork skin at 1cm intervals and rub spice mix all over pork; place skin-side up in a medium roasting tray and refrigerate, uncovered, overnight. Preheat oven to 200°C Fan Assisted function. Rub salt all over pork, including the skin, place the reserved pork rib bones in the roasting tray to use as a trivet and sit the pork belly on top; roast on the second shelf for 60 minutes until skin has bubbled and started to crisp; reduce temperature to 180°C and cook for 45 minutes. In a small jug, mix together the vinegar, stock and sugar. 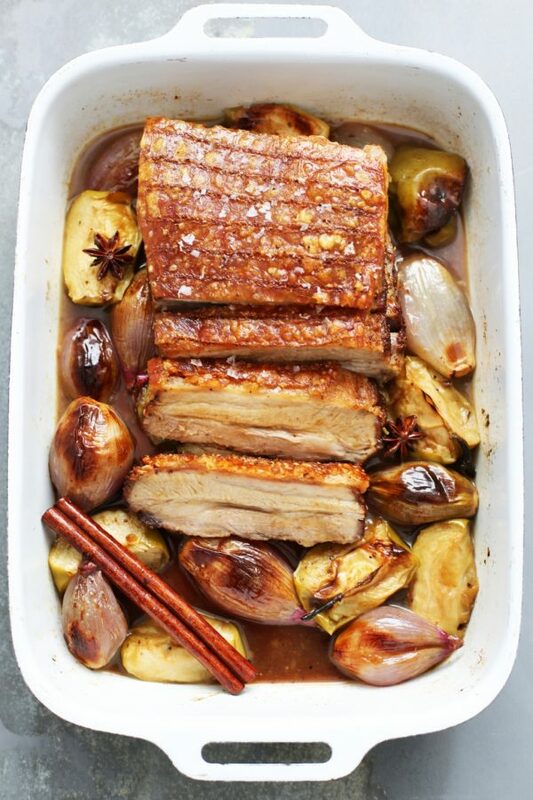 Remove the pork from oven and carefully spoon out excess rendered fat then pour the vinegar and stock mixture into roasting pan, along with the apples, shallots, star anise and cinnamon. Transfer back to the oven to cook for another 20 minutes or until the shallots are cooked and the sauce has reduced. Rest the pork for 15 minutes before turning upside-down to cut thick slices neatly through the crackling. Discard cinnamon and star anise from the spiced apple sauce and serve alongside the pork.